Butternut squash is about as good as it gets. No other veggie tastes so much like the warm, bright days of early fall. But butternut squash is propelled to greatness when baked into a pie, or paired with curry spices for a soup that melds savory with sweet. We’ve also seen it join the family BBQ. 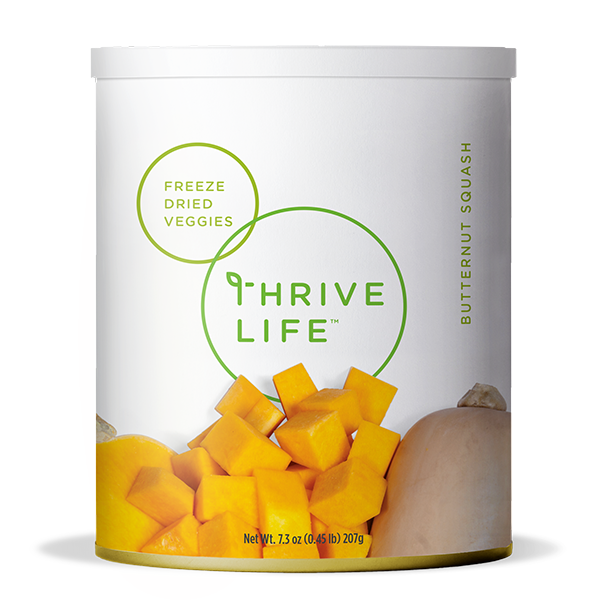 Even for the heartiest of appetites and pickiest of palates, Thrive butternut squash is a sure winner. Add 1/3 cup of water to 1 cup Butternut Squash and let sit for 5-10 minutes or until tender. Mix the chunks with other veggies for quick sides, or puree them for hearty soups. Their sweet taste also makes them ideal for adding to breads and even cakes. Just puree them into powder, add them to the dry ingredients, and add extra water to the wet ingredients.